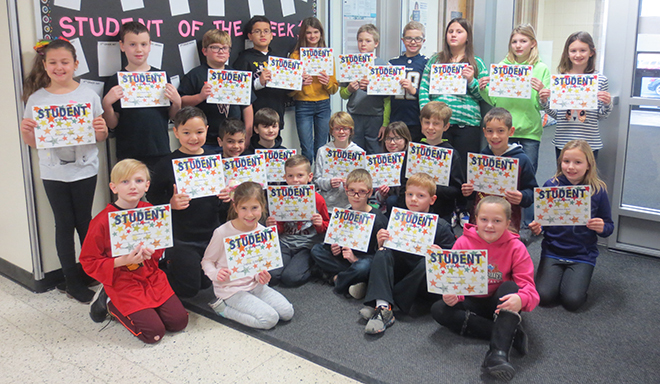 Congratulations to the following students who have been selected as Student of the Week recipients at Jean McNair Elementary School for the week of Jan. 7. Students are recognized each week for demonstrating McNair PRIDE. This includes having a positive attitude, exhibiting hard work, being responsible, and demonstrating improvement in schoolwork and/or behavior. Congratulations to (front row) ophia DiBenedetto, Hayden Bausman, Kingston Smith, Matthew Bomgarden, and Heaven Nunn, (middle row) Ryland Allen, Kayden Chy, Cooper Larson, Corran Lightfoot, Kenzie Mecum, Lehnie Gibler, Alex Wyant, Xavier Golas, and Ella Carlson, (back row) Brooklyn Sisler, Nathaniel Rossol, Ben Doty, Frank Lorenz, Samantha Falnes, James Lewis, Eli Freeman, Brianna Ellis, Lily Ernst, and Allison Dunaway.